Captions of the photos, starting with the top left. 1. The upper part of the native ocotillo plant, and the Organ Mountains. 2. The American flag, and the dome of the main building at the University of Notre Dame. 3. A beautiful sunset at Alpine, on the New Mexico and Arizona border. 4. 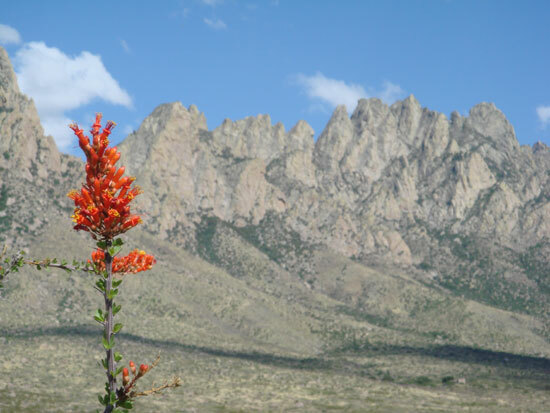 A wild flower of our Chihuahuan desert. 5. Flower of the prickly pear cactus. 6. A horned lizard captured by the camera of Father Ricardo. 7. A traditional windmill and the Organ Mountains. 8. The library at the University of Notre Dame. The student passing by is Father Ricardo. He is working on his masters degree during the Summer. 9. St. Genevieve Church with the blue skies of Las Cruces.